Welcome to a brand new post. 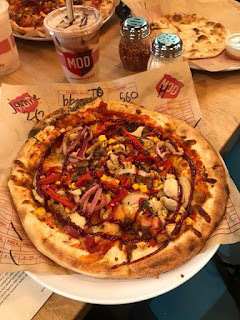 A while ago, I got to go along and check out the fairly new MOD Pizza branch in Leeds City Centre, therefore, I thought that today, I would talk to you all about what I got up to and what the pizzas were like. Mmm, Pizza. Just like other posts, if reading about Pizza isn't your thing, then please go and read a different post. There are nearly 400 posts, so there should be something for everyone on Jamie Sowden. We (myself and Luke), walked into the spacious establishment which had a sort of, rustic yet Instagrammable boho diner feel to it with wooden chairs, terrific tables and eclectic wallpaper mixed with the stainless steel feel of the counters, mixed with the rustic feel of the Pizza Ovens. The way that MOD works is that you can order one of their amazing but pre-created topping combination on your pizza, or, you can build your own. From Lactose-free Cheese, to, Gluten Free Bread, to a pizza with Cauliflower, Asparagus, or, Pineapple, to a Pizza with all meat on. The limit does not exist when it comes to Pizza toppings at MOD.. MOD actually stands for Made On Demand. If you're more of a Salad person, then, that can be made to demand too. Want a Milkshake? Well that can be made to your personal order. Chocolate with Salted Caramel? Done! MOD's soft drink selection is a Freestyle based machine, which means that, you can custom your drink to your own liking. Love Cherries? Get a drink with all Cherry in! 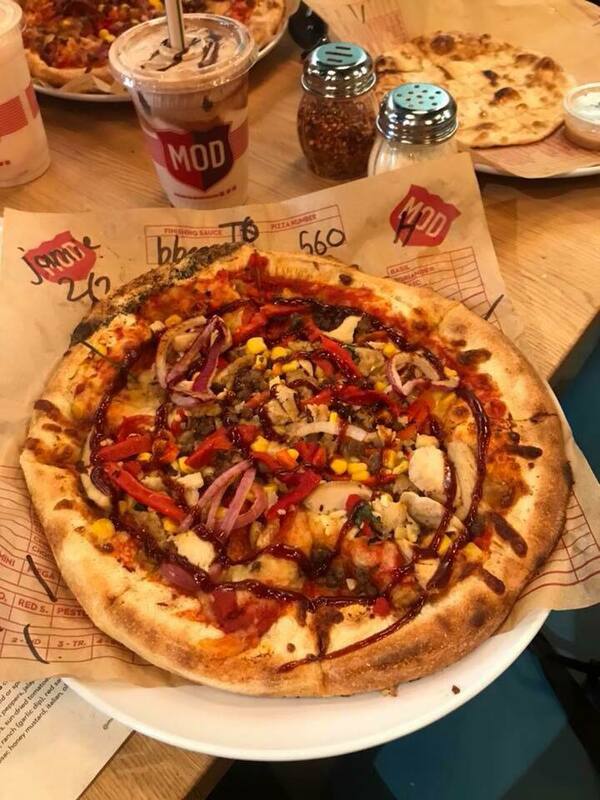 MOD Pizza's are £7.87 which I think is great for an eat in/takeaway pizza! I went up to the stand and ordered everything that myself and Luke were about to eat, (okay, I went a bit over the top, but I was excited to eat Pizza), then I received a buzzer to put on our table. This meant that the order comes straight to the table! Let's talk about drinks first, Luke got a Strawberry Milkshake, because well, he loves Strawberries and Milkshakes. I decided to go for a Chocolate Milkshake with Oreo pieces crushed up into the drink. I loved the dark contrast between the sort of rich chocolate taste with the Vanilla creaminess of the crushed up pieces of Vanilla from the Oreos. The milkshake was thick and cold, which is, everything that you want from an amazing milkshake! I also decided to get a Freestyle drink, mainly because, I have quite a dry mouth so I end up drinking like a fish. I enjoyed checking out what flavour combinations I could have, but when I found Vanilla Pepsi, I knew that I had to have it mixed with a bit of Cherry! Onto the main star of the show, the Pizza's! Luke decided to go for the Mad Dog, as he wasn't really feeling the Create Your Own. This Pizza consists of, MOD Red Sauce, Mozzarella Cheese, Pepperoni, Mild Sausage, and, Ground Beef. 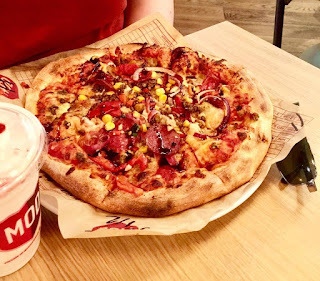 I decided to go for a Pizza that consisted of BBQ Sauce, Mozzarella, (I was tempted to go for Lacto free due to me and Lactose not being the best of friends, but, I thought screw it), all of the meats, Red Onions, Sweetcorn and, Peppers, with a Blsamic Fig glaze drizzled on top. The base was crispy, the Cheese was gooey, the Meats tasted amazing and the crisp Vegetables went well against the cooked Meats. Y'know what the best part was? That Balsamic Fig Glaze! It was tangy, but sweet, and it just made the whole Pizza pop with taste! Carrying on with all this food talk, we then got Cinnamon Strips. Yeah, you heard me right. Cinnamon. Strips. These were the best thing in the world. You can choose between Chocolate, Strawberry or Cinnamon Glaze to be embedded in the actual strips. I went for Chocolate but mizing the gooey in the middle, crisp on the outside strips, with, the sweet sugary Cinnamon dip was the best thing in the world. Honestly, I'm tempted to drag friends along just for those strips on their own. Mmm, I want some more right now! Have you ever been to MOD before? If so then let me know what your favourite Pizza is? If not, then tell me what your favourite combo would be! Thanks for reading my food based blog post. I hope that you come back next time for another blog post.